Turkish president ramps up anti-Israel rhetoric following Hamas-led confrontation on Israel-Gaza border, calls Israel 'terror state'. 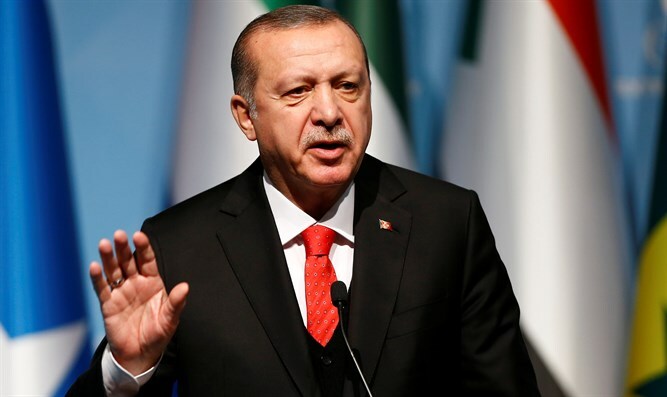 Turkish President Recep Tayyip Erdogan accused Israel of being a ‘terrorist state’ Sunday, and called Israeli Premier Binyamin Netanyahu a ‘terrorist’, after IDF forces opened fire on infiltrators during a Hamas-led confrontation on the Israel-Gaza border on Friday. Despite warnings from Israeli officials that IDF snipers would use deadly force to prevent infiltrations across the Israel-Gaza border on Friday, tens of thousands of Arab protesters marched towards the frontier, the beginning of six weeks of planned protests against President Donald Trump’s recognition of Jerusalem as Israel’s capital. The protests will culminate in a mass demonstration on May 15th, a day after Israel’s 70th Independence Day and the opening of the US embassy in Jerusalem. At least 17 protesters who attempted to scale Israel’s security fence or hurled firebombs at soldiers were killed in Friday’s clashes, with hundreds more wounded. Ten of those killed were affiliated with the Hamas terror organization which rules the Gaza Strip. That evening, the IDF thwarted an attempted shooting attack by a terror cell in northern Gaza. "We strongly condemn Israel's use of disproportionate force against Palestinians during the peaceful protests today in Gaza," the foreign ministry in Ankara said in a statement quoted by AFP. On Saturday, Turkish President Erdogan slammed Israel for the “inhumane attack”. Prime Minister Binyamin Netanyahu mocked Erdogan in a tweet Sunday, calling Erdogan’s attack an April Fool’s Day joke. “The most moral army in the world will not be lectured to on morality from someone who for years has been bombing civilians indiscriminately," Netanyahu wrote. He added, referring to April Fool's Day: "Apparently this is how they mark April 1 in Ankara." Erdogan blasted Netanyahu following the tweet, calling the Israeli premier an “occupier” and a “terrorist”. "Hey Netanyahu! You are occupier. And it is as an occupier that are you are on those lands. At the same time, you are a terrorist," Erdogan said in a televised speech in Adana, southern Turkey, AFP reported. During his speech, Erdogan also dubbed Israel a “terror state”. "I do not need to tell the world how cruel the Israeli army is. We can see what this terror state is doing by looking at the situation in Gaza and Jerusalem," Turkey’s Daily Sabah reported Erdogan as saying. In December, Turkey’s foreign ministry condemned what it called Israel's "excessive" and "disproportionate" use of force against Palestinian Arabs who protested the U.S. decision to recognize Jerusalem as Israel's capital.